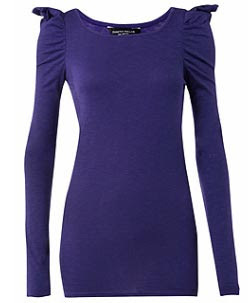 First up is this purple top from Rise a new concession brand available at Dorothy Perkins. The detailing on the shoulders of this top is very slight and discreet but it tranforms this top from plain to chic! This top is £24 and is also available in black and grey, click here to see more. This black longline cardigan is from Miss Selfridge, not only does it have pleat detail on the shoulders, it also has a bit on the sides too for pockets. You can get this for £20 click here for more info.